CHICAGO — Chicago O’Hare International Airport’s expansion efforts reached a new milestone yesterday. 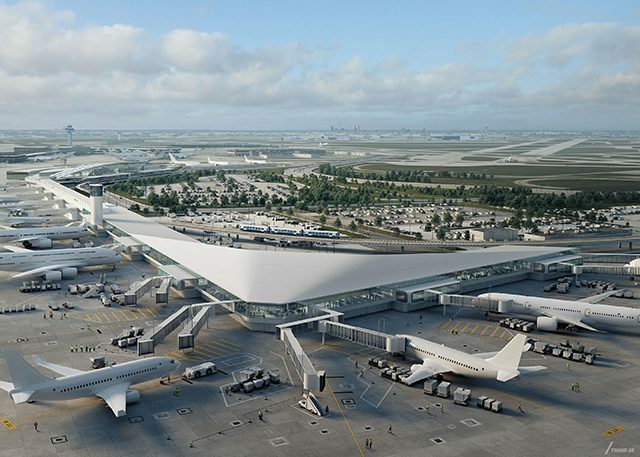 The Chicago Department of Aviation (CDA) has begun construction on the first phase of a significant expansion of Terminal 5 at O’Hare International Airport, which will provide ten much needed new gates. HOK’s Aviation + Transportation practice designs high-performance passenger terminals, stations, intermodal facilities, automatic people mover systems, light rail systems and other transportation amenities at major airports around the world, including the Hamad International Airport Passenger Terminal Complex in Doha, Qatar. Current projects include the master plan and design of new Terminal B at LaGuardia Airport in New York City, the Salt Lake City Airport Redevelopment and Hartsfield-Jackson Atlanta International Airport’s Domestic Passenger Terminal Expansion and Modernization. Projects recently completed by HOK’s Chicago studio include the new headquarters for Consumer Credit Union in Kalamazoo, MI and an expansion and renovation to the Kentucky International Convention Center in Louisville.